Certified Forensic Mental Health Evaluator Training – Gulfcoast Mental Health Counselors, Inc. 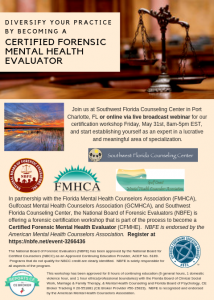 In partnership with the Florida Mental Health Counselor’s Association (FMHCA), Gulfcoast Mental Health Counselors Association (GMHC) and Southwest Florida Counseling Center, the National Board of Forensic Evaluators (NBFE) is offering a forensic certification workshop that is part of the process to become a Certified Forensic Mental Health Evaluator (CFMHE). NBFE is endorsed by the American Mental Health Counselor’s Association.